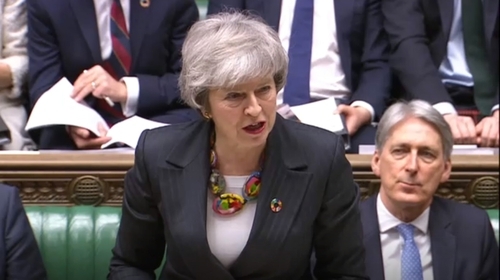 British Prime Minister Theresa May has said she told the European Parliament that the House of Commons needs legally binding changes to the backstop. She was speaking in the Commons where she gave MPs a Brexit update following her recent talks in Dublin and Brussels. She said she will be speaking to European Union leaders today and throughout the week, and will meet chief negotiator Michel Barnier before the end of the month. Mrs May said she does not agree with Labour Leader Jeremy Corbyn's suggestion that the UK remain a member of the EU customs union. She said she will make a statement to parliament on 26 February, with a vote on an amendable motion the following day, if she has not brought a deal back before then. Mrs May told MPs that talks with the EU are at a crucial stage and "we need to hold our nerve". She said she believes she can reach a deal that parliament can support. Mr Corbyn accused the prime minister of "recklessly running down the clock" towards leaving the EU without a deal. He said: "Our country is facing the biggest crisis of a generation and yet the prime minister continues to recklessly run down the clock." Listing delays to promised votes, Mr Corbyn said: "Now the prime minister comes before the house with more excuses and more delays. "In her statement she has failed to answer even the most basic questions. "In truth it appears the prime minister has just one real tactic - to run down the clock hoping members of this house are blackmailed into supporting a deeply flawed deal." Her statement came ahead of a debate and vote on Thursday on the next steps in the Brexit process. Downing Street said Mrs May's statement, which was delivered a day earlier than expected, gives MPs more time to "digest the content" ahead of Thursday. Last night, Brexit Secretary Stephen Barclay met Mr Barnier for dinner in Brussels. They had what was described as "a constructive meeting" with contacts expected to continue in the coming days. Mr Barnier yesterday warned that time was short to end the Brexit stalemate and find a way forward before 29 March. The pair agreed to hold further meetings in the coming days, while their teams continue to work to find a way forward. Mr Barclay and Mrs May's de facto deputy David Lidington have met MEPs in Strasbourg, while Foreign Secretary Jeremy Hunt met his French counterpart in Paris. Negotiations of a kind have also been taking place back in Westminster, with an exchange of letters between Mrs May and Mr Corbyn. In an interview with the Press Association, commons leader Andrea Leadsom dismissed the prospect of Mrs May adopting Mr Corbyn's "world view". Mrs Leadsom, an ardent Leave supporter, said she would stay in the cabinet to help Mrs May deliver Brexit and denied the prime minister was softening her stance over a customs union in a letter to Mr Corbyn.